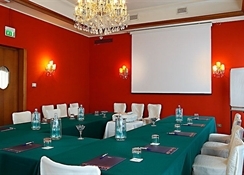 Mogliano Veneto, 4 star Hotel La Meridiana, is an elegant four-storey building with two multifunctional rooms, restaurant and ample parking, ideal for meetings, receptions or weddings. Assisted by professional and courteous staff, you will be able to book tours to Venice and make wonderful excursions along the routes of the Parque del Sile or Riviera del Brenta, receiving information and some tips. The closeness of the venues, with business events, fairs and conventions, make the Hotel Meridiana one of the favorite for business people, who appreciate the strategic location and the variety of services. Each room is designed to give moments of relaxation, from a cozy Bar (American bar) to a quiet room TV. 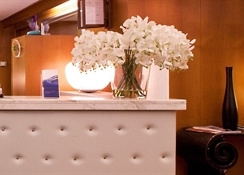 The breakfast menu, including bio and anti-aging products, is also served in the room. The hotel has wireless Internet access, fax service and elevator. 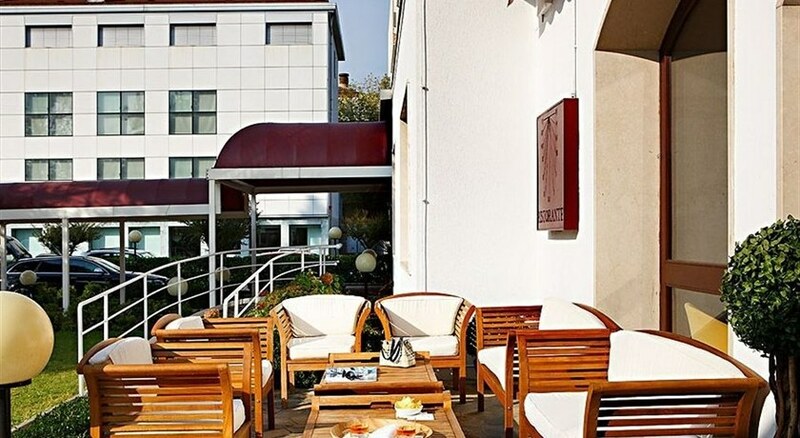 Well served by buses that run along the fascinating Via Terraglio, five minutes walk from the station Mogliano Veneto, the Hotel La Meridiana enjoys an strategic position that makes it an ideal place to enjoy the magnificence of Treviso Venice. If you seek a bit of fun, the touristic coast line awaits a few meters from the Hotel La Meridiana, while, if you love nature, enjoy the Costa del Brenta - rent a bike at reception - or stroll along the paths of the Park of Sile. 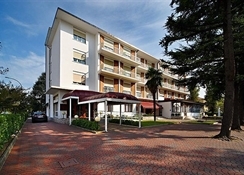 The Hotel La Meridiana is located in the province of Treviso, where some of the most important companies in the eastern Veneto are based. Endowed with ample parking for coaches and cars, the Hotel is one more comfortable of the 4-star business Hotels, with easy access from airports and major motorway leading to Venice, Treviso and Padua, the heart of cultural and business activity in the region. 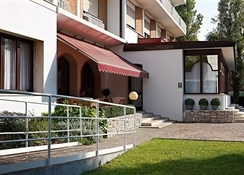 The comfortable and spacious rooms of Hotel La Meridiana, in Mogliano Veneto, are refined, quiet and relaxing. All of them have air conditioned; satellite TV, direct dial telephone, Internet access and minibar, most of them have a small terrace overlooking the garden. Rooms are offered in the category of single, double (with the possibility of being turn into triples). By train: to the Mogliano Veneto train arrive trains from Venice and Treviso. To reach the Hotel: Exit the station, turn right, via Matteotti and turn right on Via Pia accessed via Terraglio, Turn right, direction Venezia, after 300 meters you will find yourself in front of the entrance Hotel La Meridiana. By plane: International Airport of Venice, Marco Polo, It is 15 km. To reach La Meridiana Hotel, use one of the direct buses to the railway station Venezia Mestre, take the bus line and get off at Treviso stop near the Plaza de Mogliano Veneto. Alternatively, get on the train Treviso / Conegliano / Udine, get off at Mogliano Veneto and follow the directions reported in the paragraph ByTrain. Airport Treviso San Angelo is 15 Kilometers. Line 6 of the ACTT Air Terminal will take you in 15 minutes to Treviso station from which you can reach in ten minutes Mogliano Veneto station, or alternatively, use the buses direct to Venezia and get off at the stop in the square near Mogliano Veneto. By car: take the A4 motorway, get to Venezia Mestre, continue on the ring road following signs for Mogliano Veneto and Via Terraglio, go towards Treviso for approx. 5 km, just before the two lights that precede access to the town square, on the right, you will see the entrance to Hotel La Meridiana. From the A27 motorway, exit at Mogliano Veneto and continue towards Zerman, leading along the Via Zermanesa; After 4.5 km turn left onto Via Giuseppe Verdi and right at Via Ronzinella reaching the junction with via Terraglio. Keep to the right and continue towards Treviso, after 300 meters, two traffic lights before the access to the center of Mogliano, you will see the entrance to Hotel La Meridiana, on your right. When I booked the Venice break i was told that we overlooked the beach..we didn't! There are two Hotel Meridiana in venice. The hotel was a 5minute walk from the train station and it took 10-15 minutes to get to the centre of venice. My only complaint was at checkout we were charged for using the mini bar which we hadnt, s it may be a good idea to take a photo of what's in it.